If you wish to organize an international training course with Nanbu Doshu Soke, please contact the General Secretary. 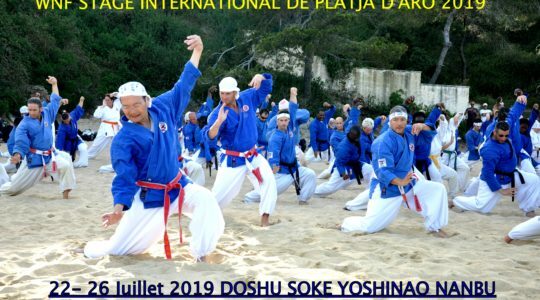 Organizers of training course with Nanbu Doshu Soke should send their details and files to be included in the list above to info@nanbudo.com at least 6 weeks prior the date of the seminar. Files must be in .pdf or .doc (for Info files) or in .xls (Pre-Registration files) format, written in English (and if possible in French). Information in files must contain arrivals options (by car, plane), training courses schedule, addresses of locations (gym, accomodations), accomodation options with price frames, seminar fees for seminar attendees, dinner cost and other additional fees for attendees of the international seminar, as well as information/arrangement of transport.